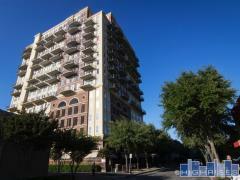 The Metropolitan is a high-rise condominium building in the heart of Downtown Dallas that overlooks beautiful Belo Garden, one of Dallas’ newest urban parks. Walk to some of Downtown’s best restaurants, entertainment centers, and parks from this location making it perfect for the urban dweller. This building is FHA and VA approved. Building amenities include concierge service, business center, clubroom, pool, and fitness center. Have any comments or questions about The Metropolitan Condos? Ask your question and/or share your thoughts about this Building. When you have guest or parties, is there parking in the parking lot of do they have to park on the street, like I did with my realtor? I am hoping there's sometime of allowance for guest and such. I am new to Dallas and plan to move to the Metropolitan. How can I get connected there? Do you have any condo functions or "meet and greet" for new residents? Where is the best place for guests to park? Is there any parking for electric vehicles in the parking garage?